The latest TiVo Video Trends Report shows that 53% say that Netflix is essential to how they get entertainment. It also shows that interest in cord-cutting and dissatisfaction with pay TV increased over the last year. It has been a year since the last TiVo Video Trends Report and consumers have changed a lot in that period. Netflix, which now has 68 million customers in the U.S. and Canada, has become an essential source of video entertainment for 53% of people answering TiVo’s survey. A third of respondents consider Netflix supplements some other video service they use. Just a few short years ago, virtually all North American consumers would have considered pay TV to be essential to their video entertainment needs. The TiVo data illustrates how much our entertainment options have expanded and changed. Cable TV, which now has fewer subscribers than Netflix, has 39.5% of consumers that consider it essential and 41% that say it is supplemental. Satellite TV is considered essential by 28% and supplemental by 39%. I have written about 2019 being a pivotal year for free ad-supported video services online. TiVo data confirms many people have already found free services and are using them. Nearly one-third of respondents reported using free streaming services. Pluto TV is among the most popular TV-like services, with 17.7% of those frequenting free sites saying they used it. 14.7% of survey respondents say they use Crackle. A surprising 1-in-5 say they use Twitch, the e-sports streaming juggernaut owned by Amazon. There are other TiVo data to emphasize the huge popularity of e-Sports. TiVo also says 12.7% say e-gaming/live stream e-gaming is their most important genre and over a quarter of survey respondents report using their TVs to play games. 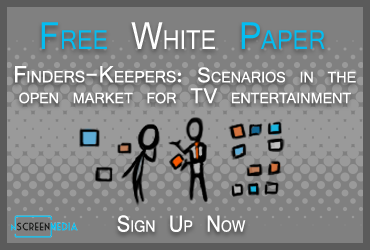 TiVo’s report provides both good and bad news for the pay TV industry. The good news is that 81% of pay TV subscribers do not plan to get rid of pay TV in the next six months. Unfortunately, 19% say they do plan to cut the cord. Worse, one year ago, only 13% said they planned to cut-the-cord. With the unhappy people leaving pay TV, you might expect more of the remainder to say they are satisfied. Once again, the news is not good for the industry. 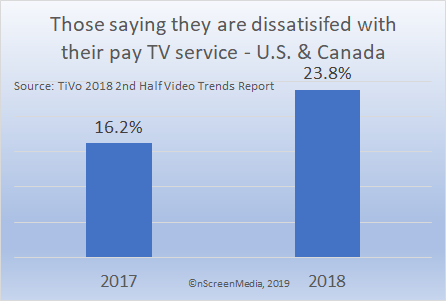 The number of people saying they are dissatisfied with their pay TV service increased from 16.2% in Q4 2017 to 23.8% in Q4 2018. TiVo data shows that more people are adopting connected TV devices. In 2017, 63.5% of people said they used one. 65.6% say the same one year later. The most popular device used is the smart TV with 27.1%. Game consoles are second, with 19.4%. The most popular dedicated streaming media device used is Roku streaming stick and players. 17.7% said they used one. However, Roku’s overall popularity is likely even higher, since TiVo lumped Roku powered televisions in with the smart TV category. Amazon Fire TV Stick (15.7%), Apple TV (13.3%) and Chromecast (12.5%) are also popular. Voice search continues to make slow, steady progress with consumers. The number of survey respondents that say they have access to voice search increased from 24.4% in 2017 to 29.5% in 2018. As well, the number of people that use it increased slightly. 57% of people with access to voice search used it in 2017, and 60% in 2018. The popularity of Amazon Alexa seems to extend into the video space. Use of voice search is much higher through Amazon Fire TV, which has integrated the Alexa voice assistant, is much higher than other devices. 40.5% of those that use voice search do so through an Amazon Fire TV device. 28.9% use an Apple TV and 24.3% use Google Chromecast.